When I first started gardening and making my own bread I had no idea how far simple acts like those would lead. 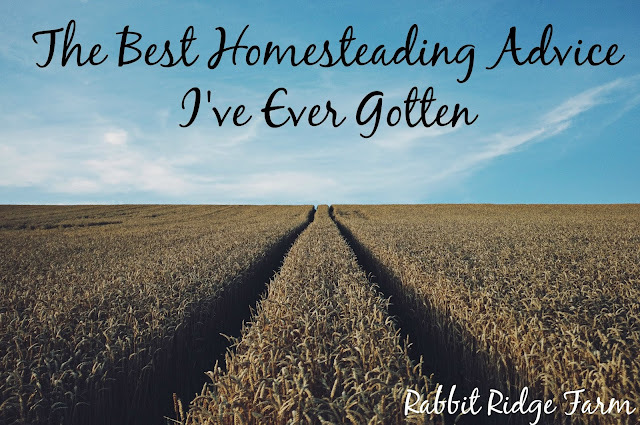 In a way that may have been a blessing because not having the specific goal of being a homesteader helped me to take things one step at a time which, as an ever-learning homesteader, is probably the best homesteading advice I have ever been given. Homesteading by its very nature is immensely difficult whether you are learning skills to help you be more self sufficient in a city apartment or living off grid in a rural area. It can be even more difficult if you over tax yourself. I have over done gardens and ended up with more produce faster than I could preserve it and been so determined to make everything from scratch that I burnt everything I was trying to cook and ended up in tears. I have learned so much. I can make soap, preserve food, garden, knit, and cook but when I try to do it all I get burnt out. I am slowly adding to the list of things I do on a regular basis. I have been making my own bread for about 6 years and now I make pretty much all the bread we eat. That doesn’t mean I am ready to start making all the soap for our household though. Try new things but be careful to add to your to do list a little at a time. Jumping in head first may work out but it will probably stress you out and make you less likely to continue homesteading. What’s your best advice?